Luol Deng was sitting back in his locker stall late Thursday following the Bulls’ overpowering 107-87 victory over the Miami Heat, a smile seemingly of both satisfaction and relief washing over his sharp features. Deng had scored 20 points, his sixth consecutive game of at least 20 points and eighth in the last 10. Carlos Boozer led the Bulls with 27 points, oh so sweet for Boozer as he makes his off season home in Miami and where his children live. Taj Gibson had a powerful 19 points off the bench and Kirk Hinrich added 13 points and seven assists along with the obligatory tussle and technical fouls, a bit too much of Hinrich’s defense for Norris Cole. Like Cole was saying, you don’t stay that close without dating. 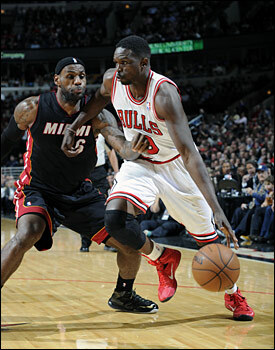 Deng had scored 20 points, his sixth consecutive game of at least 20 points and eighth in the last 10. The Bulls, 8-9, made 10 of 19 three pointers and perhaps, more importantly, held sharp shooting Miami to six of 22 threes. And most impressively, the Bulls scared the 14-5 Heat off the boards with a 49-27 pounding, 27-9 in the first half as the Bulls breezed out to a 58-44 halftime lead and remained double digits ahead the rest of the game. And then there was Joakim Noah, all flailing arms and elbows and legs, all over the Heat with 17 points and 15 rebounds, pounding his chest, screaming encouragement, unholstering his pantomime pistols. The Bulls’ emotional leader has often been missing of late, along with a lot of the emotion and passion which for the past few years mostly without Derrick Rose has enabled the Bulls to surprise the NBA, become more than the sum of their parts, be a model of commitment to the game while also a tough opponent. Those Bulls were back in the United Center again in their best game of the season just about everywhere on the court, holding the two-time champion Heat to 41.6 percent shooting while shooting 50 percent on their own, 24-6 in second chance points, 44-34 in the paint, Noah with more rebounds than the entire Heat starting lineup. Perhaps, as someone said, the Bulls need to imagine all their opponents are wearing Miami uniforms. The Bulls have had more regular season success against Miami than anyone in the NBA since the Heat rebuilt their team in the summer of 2010. They’ve dented Miami’s aura, and the Heat players didn’t much like it. The Bulls players, as well, didn’t much care for the perceived arrogance of the Heat players. Though you get to be like that when you win. And Miami has. So the games have become intense, especially with Miami turning around the success rate in the playoffs, when it counted most. So the Bulls take what they can, especially Noah. 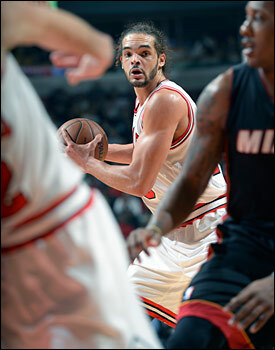 “The people in the city, there’s something when Miami comes to town,” said Noah. “You wake up in the morning you feel it, the people in the city they don’t like the Miami Heat. We don’t like the Miami Heat. It always feels good to beat them. “Lot of battles, lot of scars, lot of tough losses,” Noah added. “Lot of seasons ending because of them. But more than to just defeat Miami. They needed to be the Bulls again, the punishing rebounding team, all over the court helping and recovering, physically confronting ball handlers, out on the perimeter closing out on long distance shooters, working harder than the other guy who thinks he’s working hard. The issue is doing it often enough. The Bulls have had periods of success these last few weeks since Rose’s knee injury that put him out for the season. Rose met reporters earlier Thursday before the national TNT game (coverage here and here). Teammates said it was good just to have him around again as he was in the trainers room — his home away from home — during and after the morning shootaround in the United Center. It’s been much discussed, but it’s difficult to understand the impact Rose’s knee injury had on his teammates unless you are with them. They knew how hard last season was without Rose, but there was the vision of his return. And then it occurs yet again, but this time with change for the roster hanging over everyone. Could they go through it again? They knew what they had to do. But it was becoming difficult to maintain that edge and energy entire games. It was becoming the difference in these long games between a win and a loss, one shot in a triple overtime game. Or against Utah or Cleveland. They got that from Noah, who is slowly becoming Joakim again, also 19 points and 10 rebounds in the triple overtime loss Monday. His 15 rebounds Thursday tied a season high from the New York first home game of the season. No one wants to make excuses. But in many respects the Bulls rise and fall on Noah’s enthusiasm, the way he badgers them through games and frustrates opponents. It has come on in segments and sequences the last few weeks as Noah battled his own resolve. Carlos Boozer led the Bulls with 27 points, oh so sweet for Boozer as he makes his off season home in Miami and where his children live. That is what the NBA season is about and they know it. After all, it’s hardly like this is the first time. The Bulls did that Thursday about as well as they can. Yes, Dwyane Wade and Chris Andersen were out for Miami. But no one makes injury excuses playing the Bulls. LeBron James, who led Miami with 21 points, rumbled down court the first two Miami possessions for driving layups that had Bulls defenders sprawled out on the court. But as the Bulls responded, it was as if James kept turning around to signal his teammates to join him and there was no one there. The Bulls made their first six three pointers into midway through the second quarter, going ahead 29-20 after one quarter behind 10 points from Boozer and seven Noah rebounds to four for the entire Miami team. Late in the second quarter the Bulls were ahead by 19, and then they opened the second half, a worrisome time in some recent games, with a 14-3 run to basically take everything out of Miami. The Heat made one little threat in the fourth quarter, cutting the deficit to 93-81 with about six minutes left. Then Gibson, who has been the team’s most physical player and averaging 21.5 points and eight rebounds the last four games, made a baseline jumper and then smothered Udonis Haslem with a block. And then on the next possession, Gibson snatched a rebound away from three Heat players trying to go back up with a Rashard Lewis miss. Deng then made a three to effectively end what little suspense there was in the game. That will be the test for this Bulls team still minus Jimmy Butler with his turf toe and not close to returning, apparently. They know the formula: Defense, rebounding, effort and energy. It’s easier to summon that when the opponent is your tormentor and has the acclaim and success you desire. It’s another to have it in Milwaukee or Memphis. But that’s the test for a pro. The Bulls showed the national TV crowd Thursday and showed themselves they still are capable. But true greatness is consistency, and that’s the demand of the road ahead.